After browising Home Advisor, Ali decided he was going to give Pinnacle Exteriors a call to get a free estimate on his roof replacement project. Check out his testimonial above, and see how Pinnacle Exteriors exceeded his expectations. After a couple appointments and uncertainty as to how much she wanted done, Betty was pleased to have the Pinnacle Exteriors crew out at her property in Norristown to replace her roof. She was very pleased with the communication throughout the project, and color choices on the shingles. She didn't expect the job to be done so well, and is recommending Pinnacle Exteriors to friends and family. Pinnacle responded and offered a superior door to Joseph and Patricia, as well as a beautiful wood surround to go with the new entry door. All their questions were answered to their satisfaction, and these very thorough homeowners decided to let Pinnacle Exteriors provide them a new entry door, and wood surround, with accompanying sidelights. Joseph and Patricia were very happy with the clean up, and Pinnacle Exteriors definitely exceeded their expectations, as can be seen throughout the testimonial in the video above. After finding Pinnacle Exteriors on the internet, he was pleased with the salesperson who came out and decided to go with Pinnacle Exteriors to complete his roof and gutters. The communication was great throughout his project, and Mike is having doors installed as well, by Pinnacle Exteriors. Check out the testimonial above, and see how happy Mike was left with Pinnacle's superior service. Tracy: "We knew James worked for Pinnacle, and he did the sidinig for my parents, and he did different work for friends of our's, so that's how we heard about Pinnacle. It took about, what, like half an hour and we signed the papers because we trust James, James did a windows for us one time, and that was with Pinnacle, and it was stress free. I was here and it was before I had even left for work they had put up, oh what do you call it?" Joe:"A tarp." Tracy: "They put a tarp up out front here, and I said, 'should I go around?' And they said "No, no, no, we'll stop and you can go out your front door to get in your car." They were very polite and very courteous, and I had no problems with them. Joe: "The clean up was excellent, Pinnacle did a good job cleaning up. Didn't see no nails left around from the old shingles or nothing. A real good job." Tracy:"A really good job because we had siding done and that was by another contractor. They actually damaged our shubbery, they left debris laying all around, and I was surprised because I thought when I got home that day there was gonna be nails, and there was nothing. You couldn't find anything that they left behind, they cleaned everything up. Right, we didn't find one nail?" Joe: "Didn't find a one. We had extra quotes and they were a lot higher than Pinnacle." Tracy: "One of my reasons was because I trusted James. I just trusted his opinion and I trusted what he told me. It was great, and it was short, and it was stress free. I didn't have to call people back and go through all that. James called and said, 'We're coming out.' Whatever day it was, they came out and he came back to see if everything was okay, and that was the extent of it. One of the expectations I had was for it to be stress free, and I didn't have to be on the phone calling people back. He told me the date they were coming, and they came on that date. When they actually put the tarp up, that impressed me. They had a dumpster here, and they had a guy in the street to shut that part of the street down when the dumpster was here." Joe: "I think that was very nice, how you guys came back after you've done the roof, you came back with that drone and checked it out. I thought it was very nice of Pinnacle to do something like that." Tracy: "They already had the money, they could have just said, okay we're done." Joe: "I've never really had anyone come back when I had a project done to see if I was satisfied, and you guys are here the second time and I think that's wonderful." "Siding is what you did, but siding, capping, but more peace of mind. I was having leaks, so I had my roof fixed, but I knew I needed this so now I have peace of mind that my home will be dry, warm, and it will be inviting to others. The service, I would say was pretty phenomenal. The tenacity of the crews to keep coming back even though it was possibly a longer project than they expected, I did appreciate that. The one crew that did come, they showed up when they said they were gonna show up, did good work, fixed anything that needed to be fixed, and did a good job cleaning up. I think you guys contacted me, I checked out the videos, uh no, yeah, got an estimate right there and I felt like I got a very fair deal. It turned out to be excellent work, as you can see. Communication was fine. That's one of the reasons I went with you, because you actually answered my questions and took the time to take me through everything without giving me a hard sales pitch. My expectations were as high as for any contractor (laughing), and I would say they were met, met very well. I like that it looks a lot better than what I had previously. Thank you Pinnacle!" Adam and his wife found Pinnacle Exteriors on Google, and decided to have them replace their windows and doors after seeing the quality of their work and getting a price. Adam was happy to learn that Pinnacle Exteriors could combine his home improvement projects, to give him a great price, and leave him a loyal customer with much more work to come. Check out his testimonial above. Jeremy: The replacement of our front bay window, so it was a front bay window that protruded. So it was a custom window itself, the cap on top of the bay window, the seat, and the support that goes underneath it was the majority of the project, and then they did some flashing repair work on our back patio. Olivia: Overall from planning to finish I couldn't have been more satisfied. At our old house, we didn't really have a lot of renovation or replacement that we did. If we did it was more functional things, I mean this is a functional project obviously because it was safety related, but it was a big aesthetic part of the home. I didn't really have a lot of experience in talking about that type of project, or what that entailed, and James was really honest and really open, and just kind of took me through what he thought, and his impression as an expert with exterior homework, and I never at any point thought he was trying to steer me in one direction or the other. He was just matter of fact, based off of the trusting nature of James and the exchange we had, and feeling everything he was telling me was on point, and very well rooted in the community, it felt like they were the people to go with. Jeremy: They had some surprises where the new bay window size was smaller than the opening of the original one, so they had to block things out and cap things differently than it originally was, and every time they consulted us before they did something, and didn't just blindly go and do something we may not have agreed with. Olivia: When I drive by our house now, or even our neighbors who have commented, because they saw the work that was being done and they saw all the trucks here. People will say how beautiful it looks, and really that's something that I think... you know I'm really obviously happy it's safe, it's secure, and it's not a potential hazard to our family, or our children, or our home, the structure of it, but I think what I'm most pleased with is the custom look and that relates to the work that they actually did. Really one of the greatest things was that they were able to kind of work with us to make everything happen the way it needed to. So whether that be coordinating with me and my schedule, whether it be the financing, really it was just an overall team effort, and that made the experience really good. I think from the second time around we just looked at pricing quotes and we were able to come up with a good solution for what we wanted to achieve. It was quick and easy, we already knew what we wanted so it was easy to get a hold of em. Office was good, everybody promptly returned calls, it was good. The first project Pinnacle did, was they came in and replaced all the windows in my house as well as two of my sliding glass doors. The most recent project we had Pinnacle do is they replaced the entire roof on the house. Cleanup after the roof job was good. The guys worked from 8 in the morning until probbaly about five o' clock at night. When they were done everything was gone and cleaned up, and so it was nice to not have anything laying around the yard or out front. I think it just went quick. So I watched my neighbor have somebody else do his roof project probably over the course of three weekends, and like I said the roof was done in about eight hours. Pinnacle has done a good job of staying in contact with me, being prompt with service, and making sure everything they did I was happy with. Overall it's been a good experience, and I'll continue to use Pinnacle in the future. Ken met Pinnacle Exteriors at the Home Show at Ag Hall, at The Allentown Fairgrounds, and was followed up with for an estimate. After seeing what Pinnacle Exteriors had to offer, he was left satisfied with the price and our past work, and decided to have Pinnacle Exteriors complete his roof replacement home improvement project. Ken was happy with the work, and impressed with the expertise of the installation crew, as well as the clean up. He will be sure to recommend Pinnacle Exteriors to his friends and family. After finding Thumbtack on the internet, Aaron got a quick response from Pinnacle Exteriors, and was happy to have them replace the shingle roof on his rental home. It was a quick, but thorough job, and the workers got started early in the morning for an early finish to this new roof installation. "We got a whole new roof, they replaced some wood planks and everything. Entire siding on the whole home. Just through online searches for local companies. I looked around on the site, read other people's comments, and I did that with other companies but when they came out I just sort of liked their personality. I didn't feel like pressured, or uncomfortable, it was just like a normal interaction and very informative, but yet I felt like what I asked and what they told me was very easy to understand. The people that came through were very helpful and nice, from the workers to the men setting up the contract and everything. I was impressed with the quickness the roof was done, it was like one day. When I would come and go I would say hello and tell them what I was up to, and they would give me a quick update and it was very simple. I wasn't able to be here for the siding, so there were just a few discrepancies like gutters and trash, but I would get phone calls periodically which was helpful because they were updating me, and being that I wasn't here that was nice cause I was worried, I was out of state, you know. I've never done any of this before, so because I had to go I was really nervous, and just because I'm like that and because I didn't know if they'd have questions what was going to happen, but they called and we got things worked out, so it was easy. I didn't really know what to expect, I knew it was gonna be a big messy project and I got nervous because I'm so close to some neighbors here, but once they tore everything off they got it scooped up and away from the home and everything so that was awesome, and I just liked the fact that I didn't feel pressured or uncomfortable about that because doing this kind of work to me seems so daunting. So it was just easy, and I was just like "this is good"." Greg needed a new rof after having a 40 year old roof on top of his home. He was surprised with the fast turnover time for the estimate and job completion, and very satisfied with the professional installation crew and their clean up abilities at his Coopersburg home. See everything Greg had to say, as well as the finished roof installation job in the video testimonial above. 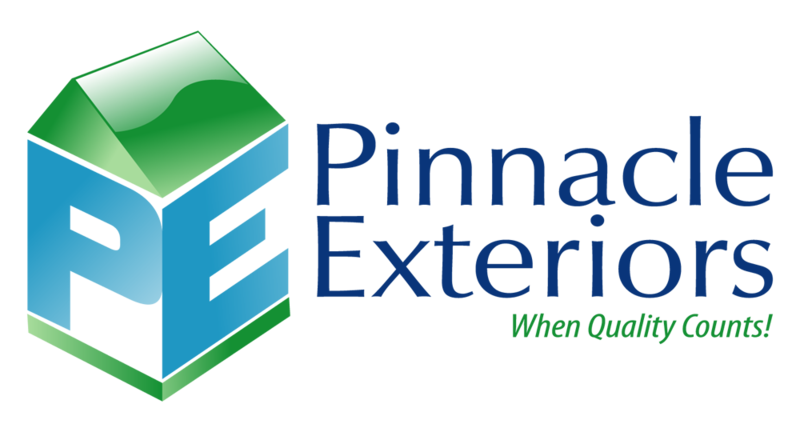 After visiting a home show at The Allentown Fairgrounds, James and his wife let Pinnacle Exteriors give them an estimate on a smaller job, and from there it blossomed in to a great friendship between Pinnacle Exteriors and James. James kept coming back for more, as he had a roof, a window, and a little siding done at first, but once he saw the work Pinnacle Exteriors provided and the quality of their work, he decided to have the rest of his properties windows, doors, and roof taken care of by Pinnacle Exteriors. James was very happy with the service, clean up, and communication throughout the project, and is happy he can now live in much more comfort, thanks to Pinnacle Exteriors. After hearing about Pinnacle Exteriors from a coworker, Janet decided to have them do an estimate at her Allentown home for a shingle roof installation. The process was very easy, and Janet was left very happy that instead of putting another patch on her roof and inevitably chasing more leaks with pots and pans, she decided to have Pinnacle Exteriors replace her roof entirely. My name is Ian Turner, and I live in Lancaster, Pennsylvania. I chose Pinnacle Exteriors to replace the roof on my 25 year old home, primarily because they were the only person who came in to give an estimate that actually inspected the interior of the attic to see if there was any interior damage, so they could anticipate any problems that might crop up while the roof was being replaced Pinnacle wasn't the lowest bid and it wasn't the highest bid, but based on the fact that they did the inspection and based the estimate on what they were seeing with the roof instead of the other contractors who simply came out, did a brief visual inspection, then took a satellite image and measure the dimensions of the roof and get back to me with an estimate. So I really thought Pinnacle was going to do the best job, in part because they had the most knowledge of the roof before going in to the project. This is the first roof that I've ever had replaced so I didn't know what quite to expect. I was very surprised when they told me they could get it done in one day. The house is about 2,400 square feet with a pretty steep pitch, but they got it torn off and put up within a day, which was good because we had a 14 inch snow storm the following day. So the roof was immediately tested and it passed all of the tests. Yes I would, there have been quite a few roofs in my neighborhood that have been replaced recently because of a hail storm we had back in the fall of 2017, and I'm really pleased based on how quickly they got it done, the price, I've talked to some of my neighbors and Pinnacle's pricing is very competitive. I'm very happy with the work that they did. Great work. Punctual. Great Clean up extremely satisfied.